The Fidelio Trio are Darragh Morgan, violin, Robin Michael, cello and Mary Dullea, piano. The Fidelio Trio (Darragh Morgan, violin, Robin Michael, cello and Mary Dullea, piano) perform extremely diverse repertoire throughout Europe, Asia and South Africa and frequently broadcast for BBC Radio 3. Since their South Bank debut they have appeared at Reggello Festival and Contemporaneamente Festival, Lodi (Italy), West Cork Music, Belfast Festival at Queens, Royal Opera House, London, Corsham Festival, Petworth Festival, Fuse Leeds, Musica Viva (Portugal) and Composer's Choice Series, National Concert Hall, Dublin. CD releases included Bulb on NMC featuring trios by Kevin Volans, Donnacha Dennehy, Deirdre Gribbin and Ed Bennett, Metamorphoses, the chamber music of Icelandic composer Haflidi Hallgrimsson, on Delphian Records, and Bartlebooth, the music of Joe Cutler, on NMC. A further CD for Delphian Records of premiere recordings of Scottish trios by Judith Weir, Nigel Osborne and Sally Beamish will be released in early 2010 and they will feature on a chamber music CD of Rolf Hind's music performing his piano trio, the thing is, commissioned by the Fidelio Trio, for Neos Musik. The Fidelio Trio have worked closely with many leading composers including Michael Nyman, Toshio Hosokawa and Howard Skempton and have premiered music by Salvatore Sciarrino, Edison Denisov, Beat Furrer and Toru Takemitsu. They are Music Network artists and supported by PRS Foundation, Culture Ireland and the Arts Council of Ireland. They have given masterclasses at the Royal Scottish Academy of Music and Drama, Royal Welsh College of Music and Drama, Birmingham Conservatoire, Royal Holloway University of London and Cork School of Music. 2009 has already seen a concert tour of China including an appearance at Shanghai's prestigious Oriental Arts Centre and a performance at London's most exciting new venue, King's Place. 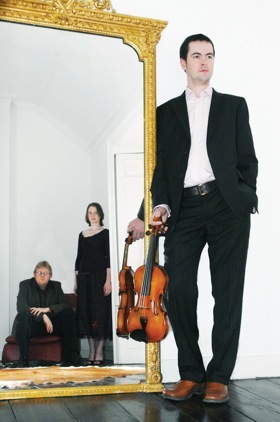 The trio will make their Wigmore Hall debut in December. In their native Ireland, they undertake a mini-residency at the Hugh Lane Gallery, Dublin, with their innovative new 'Schumann +' series and perform at the National Concert Hall as part of Music 21's series. Darragh Morgan - Soloist with Ulster Orchestra, National Symphony Orchestra of Ireland, KZN Philharmonic Orchestra, South Africa, Cyprus Chamber Orchestra. Guest leader with Ensemble Modern, Musik Fabrik, Remix Ensemble and member of Smith Quartet. Robin Michael - Performed with BCMG, Lontano and Almeida Ensemble. His diverse performing commitments include collaborations with Ronald Brautigam and Dave Holland. He has recently recorded Ginastera�s complete chamber music for Lorelt Records and plays a Vincenzo Panormo cello ca. 1791. Mary Dullea - Festival appearances at Brighton, Huddersfield, Aldeburgh and National Arts Festival (South Africa). Currently on teaching staff of Royal Welsh College of Music and Drama. Doctoral student at University of Ulster specializing in inside the piano funded by a prestigious DEL scholarship.